This is the little cubby hole where I set my cobalt blue glass on a white marble coaster; there isn't much in the way of light that can get it due to its being shielded by the flatbed scanner and a line of cd's. I picked my glass up to finish drinking the water when I noticed that there was water dripping off of the bottom of the glass and the coaster was wet like I had spilled the m-state water on it. I wiped off the bottom of the glass with my fingers, instead of wiping my hand on my jeans, I licked the water off of my fingers, to my surprise it had the most sickening sweet taste at first, ran my finger across the coaster and tasted that, it too was really sweet. I called B into the living room to run his finger across the coaster and glass just to make sure it wasn't my imagination. 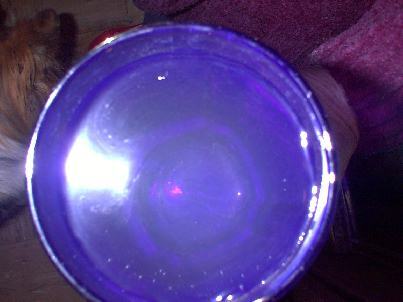 I licked the sides of the glass and it was very sweet up one side of it and all around the bottom, I sat the glass down on a paper towel on the flat bed scanner, then started licking the coaster and it was so sweet tasting at first it was almost sickening, but then got used to the taste. I even went as far as tasting the paper towel that the glass sat on when I put it down and it was sweet also, I had sat a glass of m-state water on it several times during the day and other days, without paying attention if it was damp at any time after picking up the glass. I really got curious, I licked the lid of the scanner and it was sweet as well, then went to the kitchen and started picking up all the glass bottles that do have and did have the m-state water in it, sure enough they were all sweet tasting on the bottom of them and some had a sweet taste up along the sides as well, even the two Creamora jars which are dark colored. B picked up the glass he had m-state water in and the bottom of it was sweet too. Then I glanced up at the jars of m-state water with the roses and over to the airplane plants, so picked those up and tasted the bottoms of each jar, the ones with m-state in it are sweet to the taste. The vortex trap wastewater jars and the tap water jars don't have any kind of taste at all. I'm still in awe over this!! Now since I sit my coffee cup on the same coaster in that little cubbyhole, I licked the bottom of it and sure enough it is so sweet tasting! !I had B lick the bottom of his coffee cup and his was not sweet at all. So I believe that the cobalt blue coffee cup picked up the sweetness off of the coaster and the taste was not from spilling any coffee on it, especially since all the other glass jars are sweet tasting too. We don't use sugar in our coffee or any thing else, we use sweet stevia, the sweetness is different tasting than the sweetness that is on the glass jars and the coaster, stevia leaves a slight licorice after taste, the sweetness from the jars, glass and coaster do not. We are going to experiment some more with different coaster and plastic glasses and set some glasses on magnets as well, and will tape / document every thing. One more taste test here.... the yellow rose with the red lined petals, that vile is glass, it also tastes sweet from the m-state water it had in it, it has been sitting there empty with the rose just sitting in it since about 3 a.m. (15th) last night. kitchen and the sun happened to be shining in. 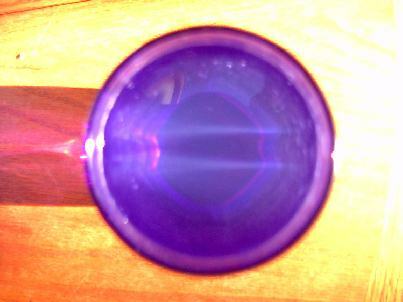 I was standing in the kitchen, holding the glass at the bottom while my husband snapped the photo looking down into the cobalt blue glass with the sun shinning through it. You can see the oil in this one, he did use the flash on this first one. 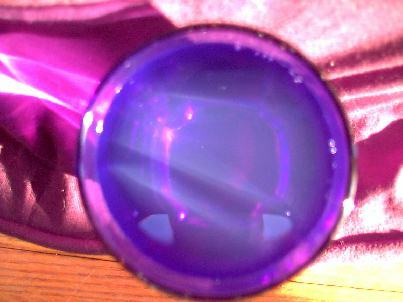 Still in the kitchen, this time no flash was used and it picked up the suns rays through the cobalt blue glass. We sat the cobalt blue glass on the light oak dinning room table out in the sun room. This is looking straight down into it with the sun shinning straight through the glass. This is a quart jar sitting in the same spot on the dinning room table out in the sun room. You can see the bands of sun rays as the sun shines through it, but we had to be at an angle to see it. We sat the cobalt blue glass on some material to see if it made any difference in the way the rays would show up any better. 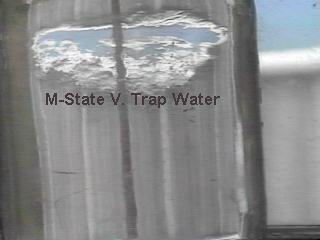 The m-state water in the glass is so milky or cloudy that you can barely see the bottom of the glass. The glass is sitting on the light oak table in the sun room. These are all the photos until the sun decides to smile upon us again!! 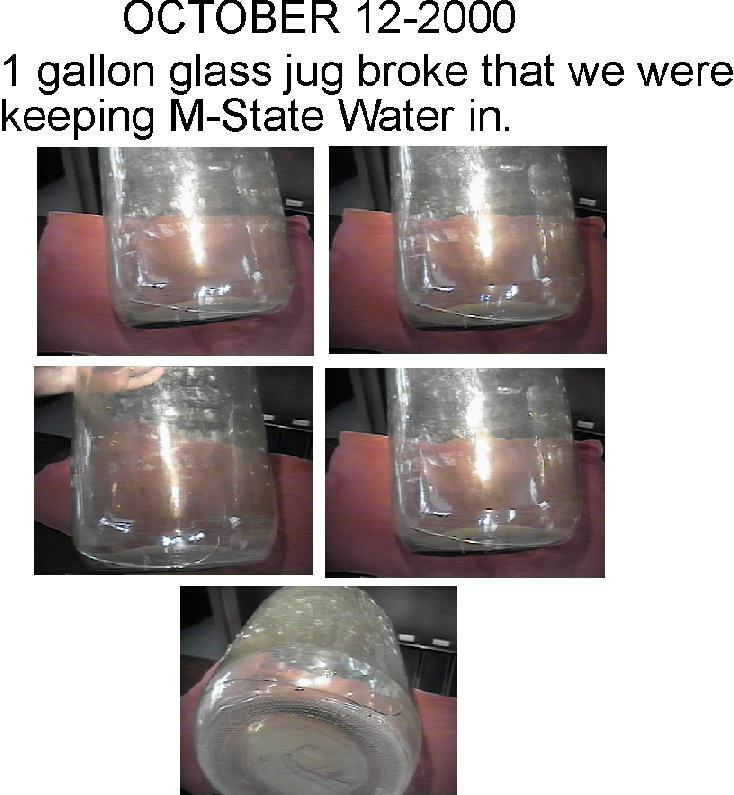 Yesterday 11-15-2000 we filled the jar on the right with m-state water, the jar on the left has tap water in it, both jars are filled equally full, to the brim. We held them up to the window to for comparison, they both look the same, nice and clear. A better look at the two jars together. A better look at the m-state jar. 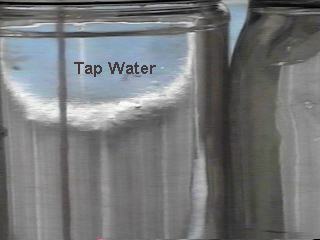 A better look at the jar with tap water. We then sat the two jars on the stove back where there isn't much light that will get to them, this is the reason that this photo is dark and grainy looking. 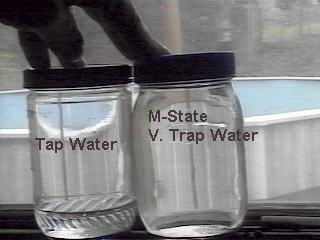 The m-state jar on the right and the tap water jar is on the left. The two jars held up again in the same spot. Here is a closer look at the two jars. 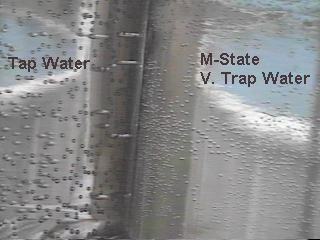 The m-state vortex trap water on the right has much more refined / smaller bubbles in it, while the tap water on the left holds larger bubbles. 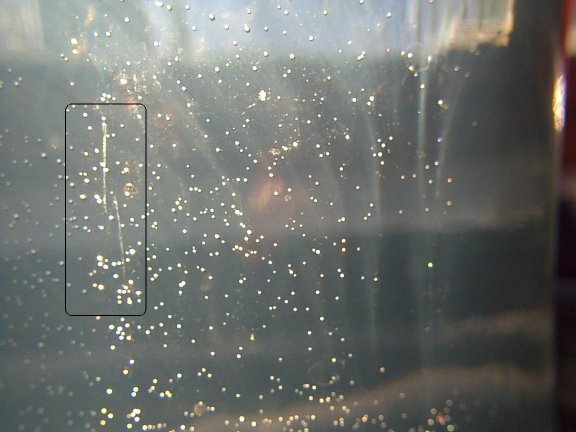 Msjar-1.jpg is a closer look at the more refined bubbles. 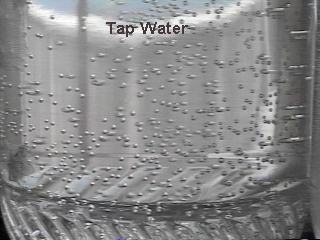 Tapjar-1.jpg is a closer look at the larger tap water bubbles. 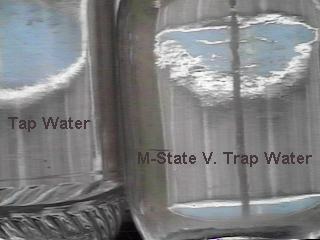 Today we decided to take some pictures comparing the first and second stage trap water with the ordinary tap water. 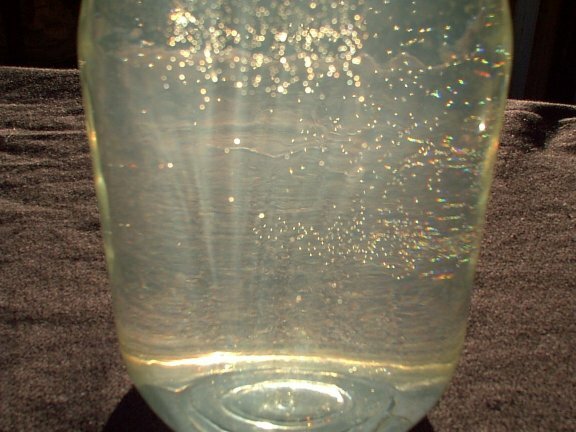 We filled three containers and this is what we found happening in our tap water after it sat for about 8 hours. We really expected it to be clear, as it had been up until now. As soon as we filled the glass (around 11 a.m.), aluminum foil was wrapped around it with another piece of foil placed over the top of the glass to help keep it clean. 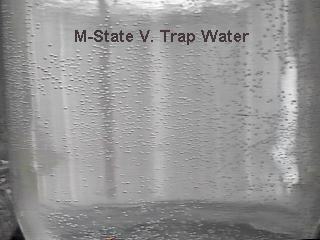 What we found is our normal tap water now shows a high content of m-state. The colloidal content, with substantial oil on the surface, was only noticeable as an output of a single stage vortex trap a few weeks ago. For some reason it is now manifesting without going through a vortex trap. 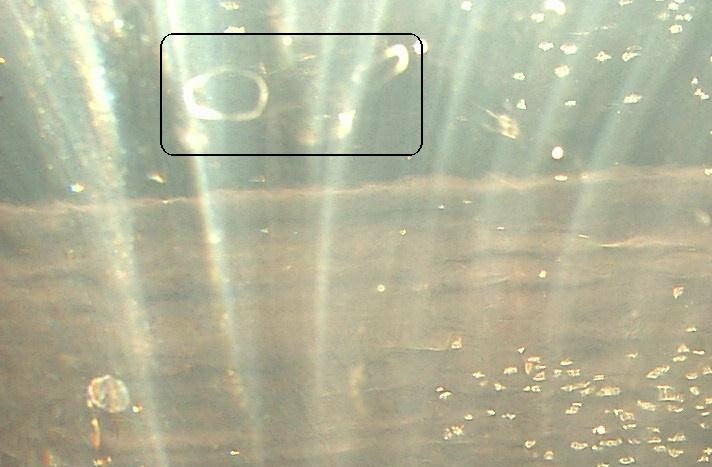 When we removed the foil cap from the glass and shined a small Mag flashlight on the surface, we saw that there was a semi-stationary vortex in the water. As we watched it we saw another vortex literally come up and off from the side of the one captured in the photo and leave the glass. As the second vortex pulled up and away from the main one in the water, it left the main vortex with a half open circle to the right that can be seen in the photo. 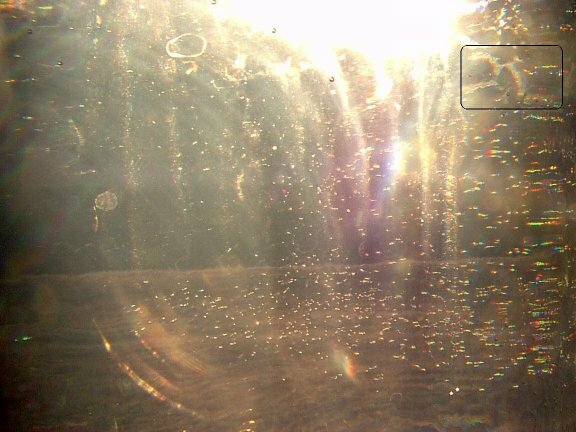 Here is another picture of the same glass that contained the vortex right after the aluminum foil was removed from the outside of the glass. 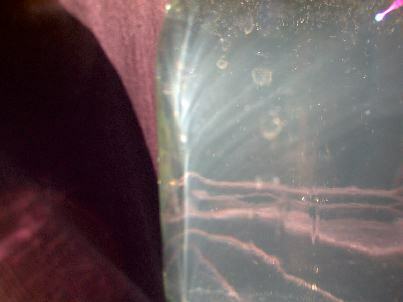 My husband shined the Mag light through the glass at the bottom, the camera caught the beam through the bottom and also caught the reflection of some vapor coming off the top of the water. As my husband and I were wondering how this could be with our plain tap water, my husband had held his hand over the top of the glass and he felt a very firm bump on his right index finger. We then both saw a burst of light that came up and out from the top of the glass that expanded as it moved. In about 2 seconds it was out of the water, inflated to the size of the soccer ball and moved quickly towards our living room. Then it landed on the floor half under the piano bench. One of our cats promptly perched and watched it. By this time we were not to sure where it went. As I walked by the piano bench into the living room, I saw what looked like a dark spot that was about the size of a small orange rise up from the floor, half hitting the underside of the bench, then burst into another bright flash. I am almost too chicken to say that I literally saw a small human type being come from this light as if being shot from a catapult then vanished. This may sound crazy and bizarre, but that is what we saw and what happened. As we stood and watched the glass, the vortex took about 20 minutes to slowly fade out but the glass is still full of evenly dispersed suspended matter. After all of this happened, we both became hungry; for some reason I felt as if I hadn't had any thing to eat all day. I also felt a surge of an energy flow throughout my whole body that started at the bottom of my feet and went upward; it literally made me feel intoxicated. This feeling comes and goes and now (12:45 a.m.) I feel so tired that I can barely keep my eyes open, yet I can still feel the flow. As a follow up on an observation my wife and I had over a year ago, I have had some time to reflect on the occurrence and wish to go on record that the event did take place as reported in the trap water diary just in case anyone reading about it may feel she was perhaps hallucinating. It was most unexpected and surprising. Repeating an experiment with our water in an attempt to find out what the little sparks are all about and get some pictures of the vortices we were observing we set about conducting the experiment as in previously successful attempts. We had drawn a glass of water as we had many times before in the early evening. The glass was immediately wrapped in aluminum foil and covered and allowed to set for about several hours until reasonably dark outside. We were expecting to see the familiar vortex in the water. 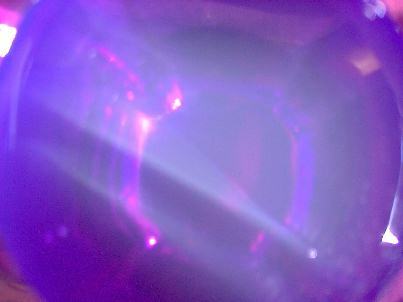 These vortices are most visible in near dark in the light of a focused beam flashlight after the water has set covered for a time. We had seen several little sparks rise quickly from the surface in the past, though not every time, and were hoping to see another. They seem to remain in the glass until we remove the top foil. Then they sort of spark off the surface. 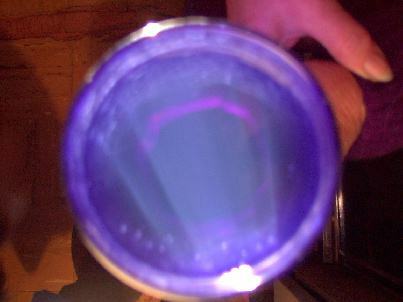 In this case, when we removed the foil we once again observed a very noticeable vortex. About a half inch wide at the surface of the water and funneling down to the bottom in a tornado shape. While not noticeably moving, these change shape over several minutes. As we observed the surface for the first few seconds we saw a bright spark leave the surface from near the center of the vortex. It almost instantly rose to the height of our faces and expanded to a semitransparent sphere about the size of softball as it rose. It was luminescent ghostly blue white in color. It seemed to bounce off both our faces a couple of times in a sort of dance then expanded further as it speed away from us toward the kitchen wall. I recall feeling a slight push backward as it bounced between us. It abruptly turned 90 degrees to the N.E. without contacting the wall and accelerated into the next room just in front of the piano. Then it abruptly dropped down under the piano bench out of sight. Our cat ran over in front of the bench and sat watching it though we could no longer see it. We realized we had both seen something and she asked, "Did you just see what I did?" "Kind of a white sphere" I said. "That's right." she confirmed. We both stood in astonishment for a few seconds. I thought the object was probably gone and returned my gaze to the vortex wondering if anything else was forthcoming. My wife slowly walked into the room by the cat and looked down to see a small, about 1 ft tall, semitransparent young, mid twenties age, fully clothed male person crouched below the bench. When he realized he had been spotted he leaped into the air and very quickly sort of soared to the far end of the room, some 25 feet, to the far set of windows and once again vanished. From my perspective in the kitchen all I saw was a bluish white streak rise up from under the bench and shoot like a comet across the doorway and out of sight. It was noticeably larger, about the size of a basketball, on my second viewing. That was my last view of our visitor. My wife saw him again a short time later, about 15 minutes, when she sat down at her computer. He was outside the windows looking in and had grown to about 3 feet and somewhat less transparent. He smiled and nodded at her! She called to me, but when I entered the room he had left for parts undisclosed and neither of us have seen him since. The purpose of this writing is to confirm from the writer's point of view and personal experience that we are surrounded by intelligence. We seem almost incapable of comprehending the extent and nature of the life force that supports us. And, many non-mainstream concepts are, unfortunately, still ignored by mainstream research. I recall a few years back while employed as an engineer in heavy industry I held up a pencil to a coworker and indicated that it could be filled with intelligent life. I received the sort of response one might expect from a typical institutionally manipulated engineer. "Anything not growing or moving around under its own power is DEAD. There may be moving electrons and such in there but no life" end of discussion!!! I also recall a reading assignment in a classical literature class in college. Though I do not recall the author or the exact phrase, the author stated that "One is on the path to discovery when one can see infinity in a grain of sand!". We do not know where our visitor hailed from or to where he returned. We do know that he answered our question. The water does contain life and those who dwell within are apparently not upset with our efforts of discovery. We look at our visitor as a messenger from an infinitely smaller or perhaps parallel universe. We seem incapable of changing the nature of life itself. If known and if empowered to do so we may not choose to do it. As we learn, we may find some lessons very disturbing. Yet, we must put each and every piece of the puzzle into place until the larger picture comes into focus. Sometimes pieces do not fit anywhere and must be stored for future use. As we share information, we may realize the piece we have fits nicely in someone else's puzzle section. And their section may fit nicely somewhere with ours. Please keep an open, unbiased mind and remember to share and enjoy life. This water went through the 2-stage trap, then we put it through the second stage trap 2 more times. The sunlight REEEEEEALY dances in this, there are more rays than Carter has little liver pills and all kinds of shapes!! I used both lenses on the camera; the 10X was on first and then the 7X. 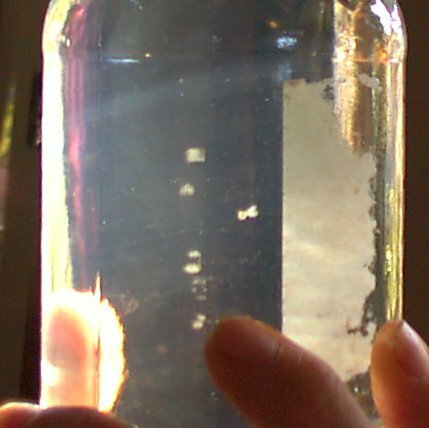 But look at how the shapes at the top are so crystalline and golden in color, they don't really look like bubbles, you can see bubbles that are nice and round on the side of the glass jar!! They literally look like suspended flakes of gold!! 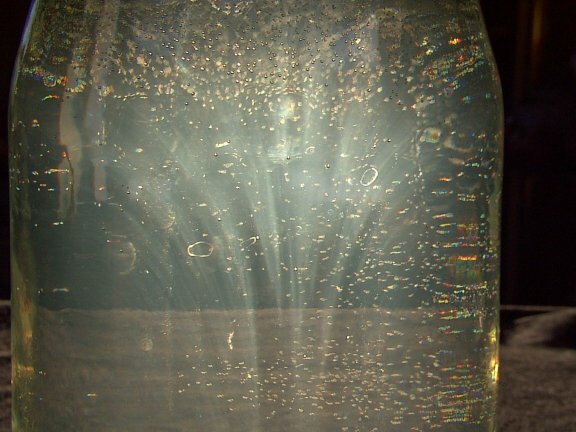 If you look straight at the jar and find some of the little round bubbles, then look off to one side, you will see that instead of round bubbles they are changing to another form!! 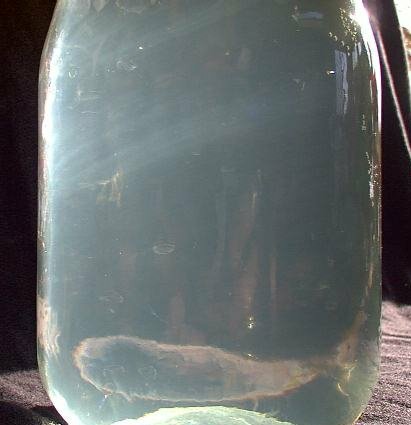 This jar when compared to the second stage trap water does have more of the ray lines. Here are the rest of the pics. These are all the same jar and using the sun; it decided to smile upon us for a little while today so I took pics like mad!! <BG> We can't get over how golden the water looks, these pics are gorgeous!! 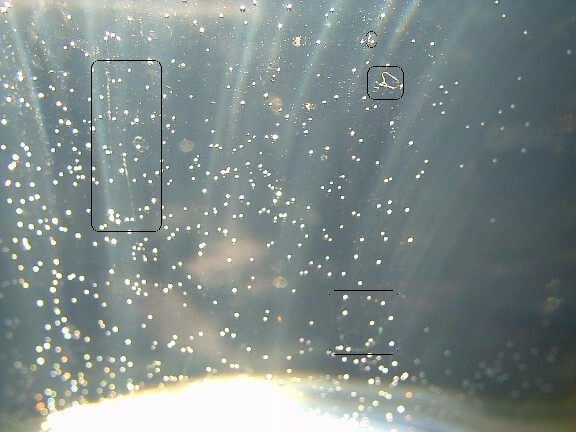 This one shows the bubbles and sun rays. A couple of things moved while the camera was taking the picture. We have seen things come up and fly off the m-state water at night in very low lighting. We feel that some of the things marked in these photos are what we see as flashes of light coming off the m-state water at night. As the particles move through the water, the lens of the camera sees the trail it leaves. The smaller circled area on the right, when enlarged or zoomed in on, looks as if it is about 3 or 4 circles within itself. The lacey patterns are really unique; they build and then fade away. 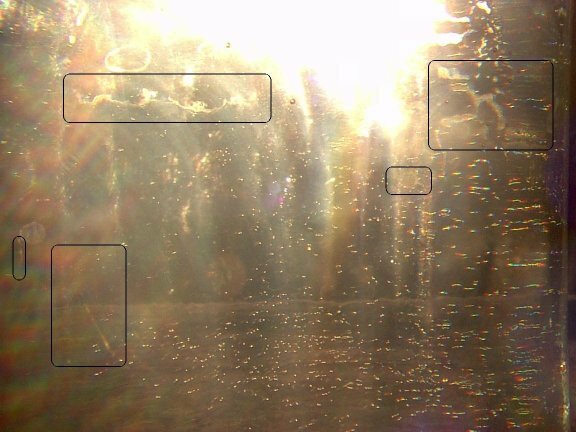 The other things marked towards the bottom left as well as on the other photos leave what looks to be ghost trails. The only item marked in this photo has changed from the last photo, this we feel really shows definate movement that only the camera can see. What looks to be 2 rings, the one on the right is new; the one on the left has shown up in previous frames. Note the fading or ghostly like appearance. On the left side of photo look at the double lines, especially the one towards the bottom in the box. There is a bubble that can be used as a marker to show that the 2 lines have moved slightly. Bottom right looks to be a ring of light that appears to be fading. Top right is something really strange and will be seen in coming photos, there was absolutely nothing such as string or hair in the water. Yet there is definitely something there! !